Shawnessy Smiles performs South Calgary Root Canal Therapy to save your teeth from extraction. 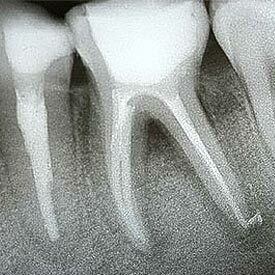 Root canal treatment removes the nerve inside the tooth when it becomes diseased or is dying. Unfortunately, your teeth are not able to heal themselves recover after disease or trauma to the nerve which makes root canal therapy a critical dental treatment to save your teeth. The color of the tooth starts to slowly darken, suggesting the nerve has died. There are may myths associated with root canal therapy, and our job is to help you make the most informed decision regarding your treatment options and how they affect your overall health. The most common myth associated with Root Canal Therapy is it’s a very painful procedure. In reality, Root Canal Therapy is carried out to relieve pain and discomfort for teeth that are diseased and infection. The Shawnessy Smiles team pays very close attention to your comfort level during and after your South Calgary Root Canal treatment, and we make adjustments along the way to ensure your comfort is maintained. Saving your natural teeth is always our first option — preserving your natural teeth is our top priority. There are situations when root canal therapy is not an ideal treatment option, and the need for an extraction is unavoidable. Prevent root canal therapy can be achieved by maintaining proper oral hygiene practices, choosing a healthy diet, and by wearing a custom sports mouthguard to prevent injury to the teeth. Regular dental visits with Dr. Roman Koutsil to diagnose and treat underlying issues early, before they also progress greatly reducing your risk of infection and ultimately the need for root canal therapy. We know that restoring your natural teeth for a lifetime of use is very important to you which is why we offer South Calgary Root Canal Therapy to help you achieve your goal for optimum dental health and wellness. Call us today at (403) 254-1124 to schedule your appointment with Dr. Roman Koutsil to learn more about your options for South Calgary Root Canal therapy at Shawnessy Smiles Clinic!